Is governed by a board, council, commission, committee, authority or corporation with policy-making authority that is separate from the state and the governing body of the city, county, or cities and counties in which it operates. Has the independent authority to generate public funds or may receive and expend public funds, grants, awards or appropriations from the state, any agency, city, county or SPGE. NOTE: If after reading the above definition of an SPGE you believe your entity is one, please send a letter to the address below, stating why you feel your entity meets the definition of an SPGE. Please attach your entity's creation documentation, which might be an ordinance, articles of incorporation, or an interlocal agreement. The Department for Local Government was charged with implementing HB1. The Cities and Special Districts Branch was given the task of overseeing the design and creation of the data submission process required by the law. In creating the forms and a web-portal, two main goals were kept in mind: compliance with the law, and user friendliness. The outcome of this effort has been a process defined by two separate parts – Registration and Financial Disclosure. An SPGE must complete both parts to be in compliance with the law. KRS 65A requires that all SPGEs register annually with the Department for Local Government and pay an annual registration fee. The Registration form collects basic information about the SPGE, including: the district’s point of contact, physical location, and operational boundaries; a list of entities that have oversight over the SPGE; KRS statute under which the SPGE was formed; date, time and location of board meetings; a listing of board members; if the entity has taxing authority; and the types of services provided by the SPGE. A tutorial on filling out the form is available on the “Registration / Financial Disclosure” page, under the county selection box. Once the Registration form has been completed, the system will pull up the registration fee payment page. 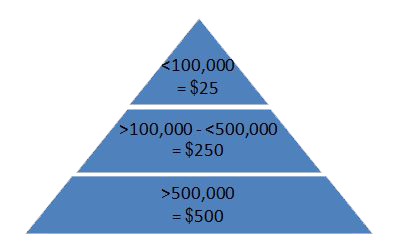 The fee is calculated by the following tier system, based on the SPGE’s total annual revenues. Registration fee payments must be made online. They can be made with a credit or debit card or by electronic check (electronic bank draft). We cannot accept paper checks. If your entity does not have a credit/debit card, we recommend using the electronic check option. Simply type in the account and routing numbers of the checking account, and an electronic bank draft will be pulled from your account. After payment has been made, a receipt will be provided on the payment page. Please print this as proof of payment. The registration fee is tied to the registration process, to move on to financial disclosure, both must be completed. The financial disclosure process is a one year reflection of an SPGE’s finances. The first part of the process is the budget submission – beginning with initial budget estimates; then, submission of amendments or line item transfers made to the budget throughout the fiscal year; and finally, submission of the year-end actuals for each budget category. NOTE: The actuals are unaudited numbers. The second part of the financial disclosure process is the audit/attestation engagement requirement. 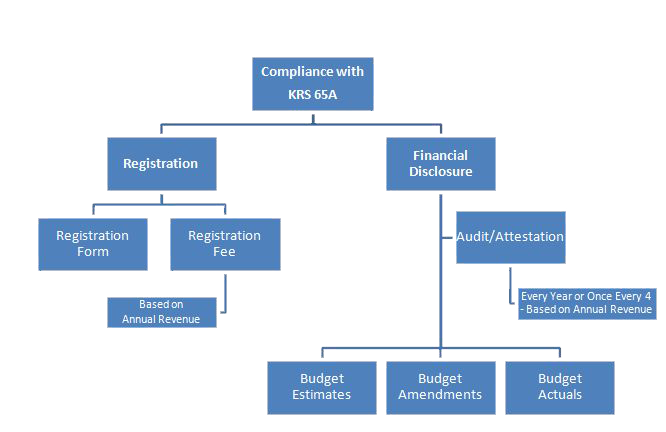 KRS 65A.030 establishes the audit reporting requirements for SPGEs with a three-tier system. This system is defined by an SPGE’s total annual revenues. Entities with less than $100,000, or greater than $100,000 but less than $500,000, may choose when to start their four year cycle. 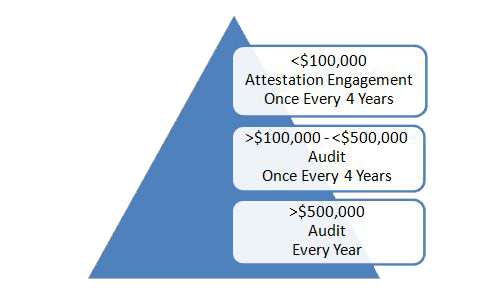 When an entity submits their first audit/attestation engagement, they officially start their four-year clock to submit their next audit/attestation. This meets the minimum standards set forth by the law. If an entity has audits performed more often than the law requires, we recommend uploading these audits to go “above and beyond” statute requirements. An entity has 12 months to complete the audit/attestation process. Once the audit/attestation has been received from the CPA, the district has two weeks to upload it into the system. At the Department for Local Government, we understand the stress associated with learning and following new statutory requirements. We have tried to keep this in mind when designing the implementation of KRS 65A . Please feel free to call or email the Cities & Special District staff at our office to ask any questions or voice concerns you might have.